Last year I presented some school stats from our national research dataset to a meeting of Victorian Bursars. 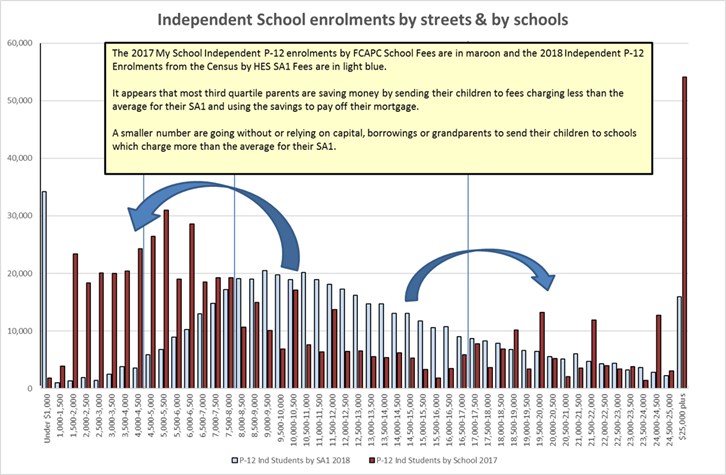 In one chart, shown below, I ranked Australian Independent enrolments by neighbourhood, according to the average P-12 fees shown by the Household Expenditure Survey, and I ranked the Independent enrolments by school, using the average P-12 fees from My School. Then we took the two sets of numbers and inserted them in the same schematic. So what you are looking at here is the average number of students across Australia on the vertical axis and the fees paid by parents and charged by schools on the horizontal axis. The students by suburbs are distributed in a nice blue bell curve pattern, with a mid-point about $10,000 and a longish tail out to the high fee end. The students distributed by schools, on the other hand, shown in maroon, are clustered towards the low fee end, with a mid-point of about $8,000 and a large bump at the fair right hand side, for the high fee schools. This leaves a dearth of middle fee schools, compared to the average fees paid in the neighbourhoods which provide their students. This infers schools in the third fee quartile charging between $8,000 and $17,000 should have been growing strongly in recent years, shouldn’t they? But we know from My School data they weren’t. 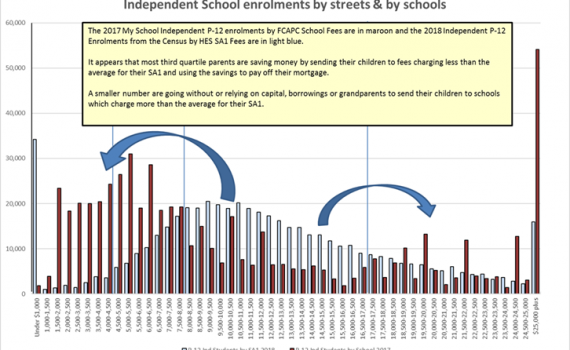 The My School statistics show half of the increases in Independent enrolments from 2008 to 2017 were in the bottom fee quartile of schools by student numbers, while three quarters of the increase were in the bottom two fee quartiles of schools. This means lower fee schools have been growing much faster than those in the top half of the fee range, but within the top half, there has also been a jump in demand for schools at the very high fee end, charging $25,000 and above. (Bear in mind these national P-12 fee figures tend to be higher in Victoria, and lower in Queensland). And there has been a softening of demand in recent years for places in middle fee schools charging fees either side of the $10,000 half way mark. From our national data on fees and our modelling of more than 100 Non-Government schools, we know demand has continued to grow for low fee Independent schools in outer metropolitan areas, among lower SES self-employed working families and supporters of more evangelical religions. The picture changes as we move closer to the higher SES suburbs closest to the CBD. In recent years, the middle fee schools in middle class suburbs have been adversely impacted by a loss of part time jobs for mothers, who have been unable to return to the workforce in their former sales or clerical jobs, specifically to pay for Independent school fees, as these are jobs being hit hardest by digital disruption. It is these parents who are now crowding out very fast growing high SES State schools in middle white collar suburbs. The middle class families lucky enough to find part time clerical or sales work in jobs most impacted by technology are living in the third quartile suburbs in our schematic, but more of them are choosing lower fee schools than they would have chosen in a more prosperous economic climate. The wealth effect among more asset rich families has boosted demand for Independent school places in the higher SES inner suburbs, thanks to sustained low interest rates. This means economic factors have pulled more of the central bell curve down the fee ranges towards lower fee schools in outer metropolitan areas, while the wealth effect has pulled some professional families in the third quartile up towards the higher fee end. This has left something of a vacuum for the middle fee schools, now competing more with a more aggressive State school sector. In the future, I don’t think the wealth effect can be sustained much longer, with tighter lending regulation by APRA doing the RBA’s job of higher interest rates in driving down previously fast rising house prices, particularly in Sydney and Melbourne. This infers a softening of demand and a more competitive market in these suburbs for higher fee schools. If the upswing in the jobs market over the past year or so continues into 2019, we would expect to see more of the third quartile families having the confidence to pay medium to high school fees. If however, the 2018 upswing flattens out during the election campaign in 2019, middle class families across the country will choose the more affordable lower fee Independent school options, or drift off to the State school sector.